2018 Nissan Titan XD Review: Japan's Best Attempt At Winning Over America? Spoiler: It’ll make your accountant happy. Climbing up into the cab of a banana yellow Nissan Titan XD at 2:37 in the morning might seem like an odd occasion for one to start pondering the human brain’s ability to lie to itself. But rest assured, there was no better time than now. The Titan’s engineers, keen on making Nissan’s latest attempt to prying its way into the American truck market a success, seem to have built the truck by writing down every metric that make Ford the dominant force in the pickup market and trying to chisel a Nissan badge into that. It could have worked, but an empty moonlit Phoenix highway and the echo of a chatterbox suspension off the walls of a cavernous interior provided me with the perfect meditation chamber where, stuck in the throes of deep thought, I became painfully aware that Nissan shot itself in the foot with this one. 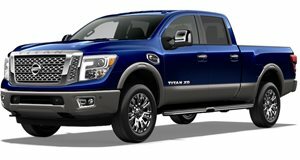 Let me start by saying that if there is a fault with the Nissan Titan XD, it has little to do with the 5.0-liter turbo diesel V8 engine from Cummins. Nor is it the Aisin-supplied six-speed automatic gearbox that’s to blame for the Titan XD’s faults. It’s how Nissan mated the two together that makes the truck feel awkward and serves as a metaphor for its small range of capabilities. Designing a gearbox that translates the right foot’s intentions to the road whether the bed is loaded with cargo or nothing but air is tough, but the Titan XD leaves one with the feeling that Nissan could have spent more time refining that process. Rounding corners at neighborhood speeds confuses the transmission, which is left wondering whether it should keep the engine at high RPMs and ready for a forward charge or shift up and quiet the diesel roar. Asking for a passing gear on the freeway also trips the gearbox up as if time wasn’t of the essence, but it eventually delivers and lets the RPMs rise as it slowly begins the arduous process of overtaking. The engine’s beefy 310 horsepower and 555 lb-ft of torque means thrust is no laughing matter, but the feeling of disconnect between what the driver demands and what the wheels do makes it so that one has to do some mental work to adapt. Confidence can be gained through practice, however, but the job is made harder by the suspension and steering. Unlike the Ford F-250 SuperDuty, the Titan XD is welcomingly soft on most road surfaces—beating the Ford as the more comfortable truck for those living in the pothole infested cities of this country. Unfortunately, this well-intentioned feature only reinforces the sense that the truck’s components were taught how to work together only on certain parts of the usage spectrum. The soft suspension and feather-light steering removes the chore of maneuvering the Titan XD’s gargantuan body around the city, but the lack of a taut ride causes a driver to have to slow down and take corners gently so that body roll doesn’t send occupants into the doors. Unnervingly, the Titan XD’s easy maneuverability fails it most on the highway where upmost control of truck is desired, especially when a trailer is attached. The light steering and a somewhat short rack makes the XD a handful at speed, requiring constant attention and a continuous seesaw of the wheel to keep the truck within its lane. These headaches might keep the Titan XD from being a segment leader, but by no means do they make it unbearable. Looks, as always, are subjective. While the Titan XD might not fit the definition of handsome for some, it dominates visually with a striking front end and proportions that intimidate the surrounding crowd even in states where trucks rule the roads. A Solar Flare paint job might not be the first shade of color this humble driver would opt for, but it combines with the unique body perfectly for any truck buyer that wants to stand out from the Silverados, Rams, and F-150s that crowd American roads. In fact, it’s in this department that Nissan nails it. In a country that’s dominated by the automobile, standing out from the crowd takes a concerted effort. But to obtain that, a Titan XD buyer has to make some compromises. The interior is one of those. It feels as spacious a concert hall, has plenty of clever storage space and charging ports of all kinds, and looks no more dated than the F-250’s insides, but the infotainment system could use a complete overhaul to bring it into the age of Bitcoin mania and smartphones that recognize your face. Our Crew Cab Titan XD came with most of the bells and whistles too, including the Pro-4X package that adds utility, luxury, and convenience. That includes everything like a well-appointed interior with stitched leather seats that are heated and cooled up front and heated in the rear, remote start, a plethora of cameras and sonar to help a driver navigate the diesel fortress around tight parking spaces, blind spot monitoring and rear cross traffic alert in case the cameras aren't enough, and a banging Rockford sound system to make a day on the construction site as pleasurable as the Titan makes it easy. The tradeoff, as one would expect from a truck maker trying to breech the stubborn American market, is that the Titan XD undercuts the competition. All toys included, our “Yellow Submarine” as it came to be known, could be had for $60,250 including the $1,195 destination charge. Is it all worth it? Well, that depends on what you’re looking for. As a work truck, the Titan feels as capable as any—ready to tow for the long haul as long as you can get over brakes that take a decent stab to check whether or not they’re up for a big bite. But as an off roader, the Cummins feels out of its element bouncing over Baja even though the Pro-4X package leaves it as ready as it can be using chunky tires and a stout suspension. It's in the city where the Titan XD falls most short, being classified only as “adequate”. As king of no domain except the price tag, the XD is unfortunately not the Titan that will win the hearts and minds of Americans.